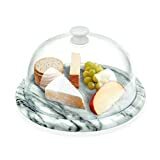 When entertaining guests, don't just serve up cheese, fruits, and meats on a plate, put them fully on display with this cool new Wood Marble Covered Server. 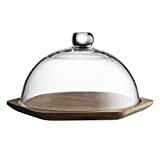 This modern covered cheese server consists of a glass cone-shaped dome that rests upon a base crafted from warm mango wood and cool marble. Makes a truly beautiful presentation for any tasty appetizer.